I found a very interesting article on making hot chocolate in today’s Daily Inter Lake, originally from the Star Tribune in St. Paul Minnesota, by Rick Nelson (1). While making note of the ingredients is important, I found his tips to be even more helpful. Perhaps you will too. These tips are from Rick Nelson’s article (1), with added information by Cat. Bar chocolate: Use a mix of semisweet (54% cacao mass) and bittersweet (70% or more cacao mass) chocolate (bars); see Cat’s article Chocolate (About) for more about cacao mass). [Or, use a tip from a friend of mine: a mix of white chocolate and bittersweet chocolate]. Pulse in a food processor until it is a fine powder or just small chips; the finer the bits, the faster it blends into the beverage while heating. Cocoa powder (cacao with most of the chocolate-butter removed, and with no added sugar), which “helps the milk and the chocolate adhere to one another” when heated with the milk. However, if you’re not in a hurry, you don’t need the cocoa powder if you heat the mix super-slow. (See Cat’s article Chocolate (About) for more about cocoa powder). How much of each? “Roughly 3 parts chocolate and 1 part cocoa” (measured in grams on your kitchen scale). 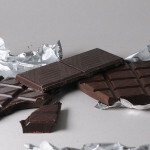 For the chocolate, if you want it sweet without adding sugar, use mostly semisweet; if you want it less sweet, and/or maximum health benefits, use mostly bittersweet. Milk: “Choose this wisely;” (1) the less processed, the better. Cat’s preference is raw milk with the cream on top. But here in Montana, it is illegal to buy/sell raw milk, so the next best choice is simply pasteurized, cream-on-top, whole milk from a local dairy, such as from our local Kalispell Kreamery. The article recommends “whole milk,” and Cat warns against ultra-pasteurized milk (see Cat’s post, Problems of Commercial & Ultra-Pasteurized Milk for lots more about this). Watch the temperature: This is probably the most important tip, because if heated too high, the milk will curdle and the flavor changes. “The lower, the better, and the slower you can heat it up, the better. The ideal temperature: 145 to 150 degrees, tops. You never want to boil milk…. As milk heats, the lactose breaks down into simple sugars, but after 165 degrees you start to caramelize them. The milk loses its creaminess, and you end up with burned flavors.” (1) You don’t have to use a milk thermometer, just watch for the first appearance of steam hovering above the milk; that’s the indicator it has reached 145°F. If it heats above that, it begins to break down. Optional: use a crock-pot, especially if making at home, and time is not an issue, as it heats the mix slowly for the best texture and flavor. I do not recommend using commercial marshmallows, because they are likely made with GMO ingredients: HFCS (high fructose corn syrup), beet sugar, corn syrup and/or corn starch. Many brands are made with albumen from egg whites, which likely come from hens that are not allowed to free-range in pasture. Even Alton Brown’s recipe (2) uses questionable ingredients: corn starch (likely GMO corn), sugar (likely GMO beet sugar), and non-stick spray (likely GMO corn, soy or canola oil). If you make your marshmallows from scratch, try Learning Herbs (3) or Wellness Mamma (4) recipe, which include marshmallow root – an ingredient for which “marshmallows” are named – a healthful herb that is soothing for the digestive tract. Serve it in your favorite cup, relax, and enjoy! This entry was posted in Blended, Chocolate, Cocoa, Dairy, Medicinal, Simmered, Sweetener and tagged cacao mass, chocolate, cream, marshmallows, milk. Bookmark the permalink.